The dog is shedding again. She’s an American Akita, so blows her coat twice a year – but man, to me it feels like she never stops! I brushed the hell out of her yesterday and only got about half of it out (if even). Lumi, however, thought this was the best thing ever. To be honest, anything new to him is The Best Thing Ever. I’ve never had a more inquisitive cat in my life. He was right there underfoot, all six feet that were involved, and adding his four to the mix. Neko was not pleased as she always thinks I’m scary, and a cat sniffing around her feet didn’t help! She put up with it, anyway, and after I fought the static-cling and released her from the torture, I was left with half my kitchen covered in dog hair. And Lumi, still fascinated by the carnage. Of course there is Lokii too, having a quick sniff and running off. But look at Lumi’s face! This needs a good caption. Ha! I like it! Despite the fact that if you mess with him he falls over on his side and purrs like a madthing. 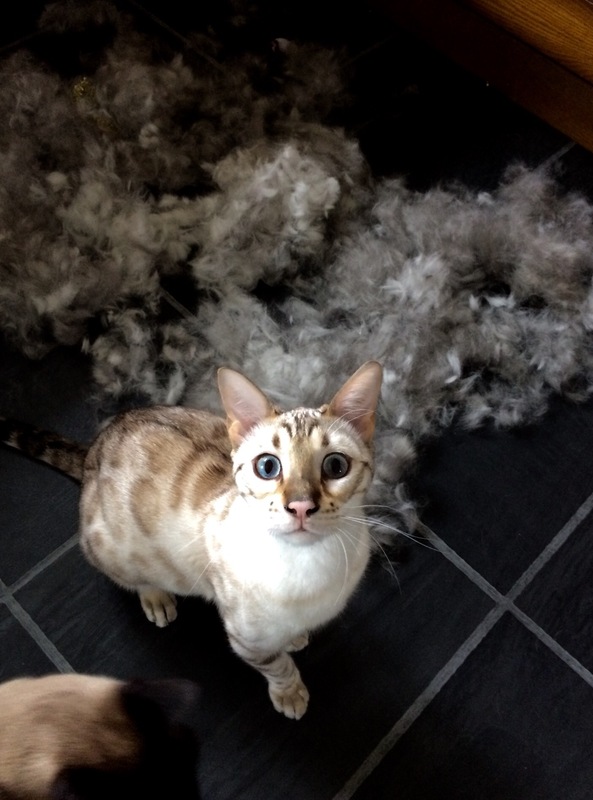 I swear, ma, the dog just exploded! “YAY, YOU ARE FINALLY SHAVING THE DOG! But the cat would still be thinking it. Because cats. Not my good boys! They kill bugs. That’s about it. Ours kills bugs… then eats them… then throws them up a few hours later. Lovely. Not. Really? Ours never barf them up again. But I did take a bright green caterpillar off of Lumi this morning as I knew that wouldn’t end well. Ours does it all the time. I swear she never learns! I LOVE that look on his face! He looks surprised, to me! A clear cat evaluation of the situation: shock and awe. People say blowing coat is only twice a year – but here it’s constant, too. Brushing until dog gone from tired of being in one place and the brusher looks like some odd mythical hairy creature! Paw waves for your efforts! I just wish she liked being brushed – the cats adore it! Why does she inch away from me until I’m leaning all over the kitchen floor? It surely must feel good to have that extra dead hair out? Or even a nice full body scratch? I sure as hell would enjoy one! Lumi looks rather majestic amongst all that rubble. A calming influence in a hair-storm. He thought it was Super Duper Play Time!